With recent Anzac commemorations, in this post we look at the use of the term ‘Anzac’. any trade, business, private residence, boat, vehicle or charitable or other institution, or any building, without the authority of the Minister for Veterans’ Affairs. Many people had started using the word ‘Anzac’ for different purposes before the government intervened in 1916 and added a regulation under the War Precautions Act to restrict the use of the term. 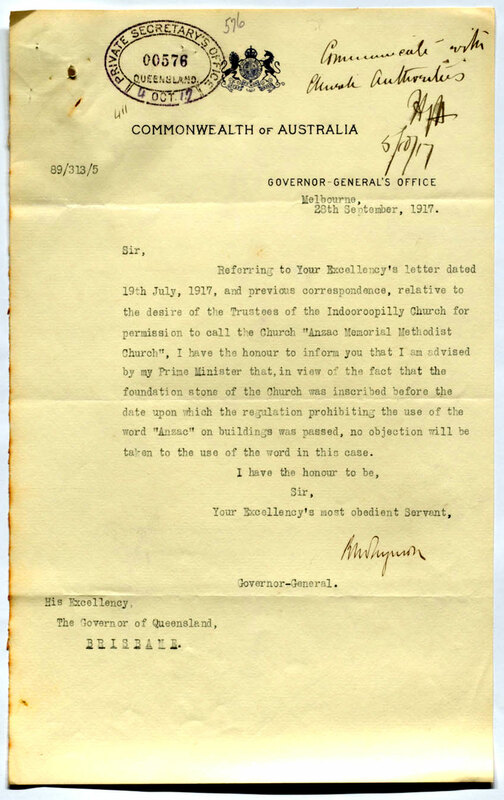 The featured letter written to the Governor of Queensland by the Governor General of Australia, advises him that the trustees of the Anzac Memorial Church at Indooroopilly could continue to call the church by that name. In 1916 this was a Methodist Church; in 2014 it is a Uniting Church. Photos courtesy of Darren Reddacliff. 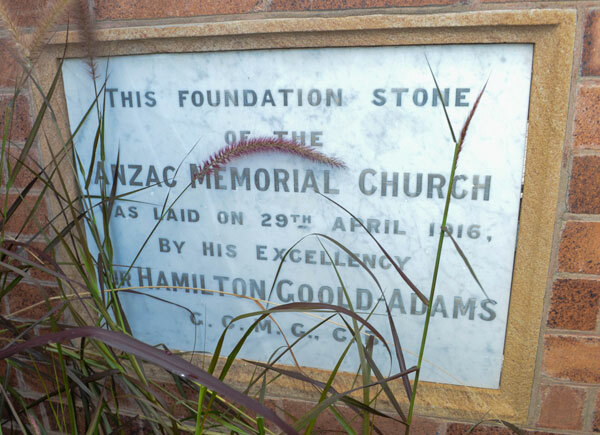 That was fortunate as ‘Anzac Memorial Church’ was inscribed on the foundation stone laid on the 29 April 1916 by Major Sir Hamilton John Goold-Adams (Governor of Queensland). The series of letters discussing clarification about this can be viewed in Image Queensland. I have seen the term ‘Anzac’ used in chapel names, but do you know of any other churches with ‘Anzac’ in their title?